Congratulations! UTM Researchers, Associate Professor Dr. Mohd Azizi Che Yunus, a Researcher from the Lipid and Applied Engineering Research Center (CLEAR), together with his research team members, was one of the winners of the “Islamic Innovation Challenge (IIC)” competition organized by Platcom Venture Sdn Bhd under the Malaysian Innovation Agency (AIM). 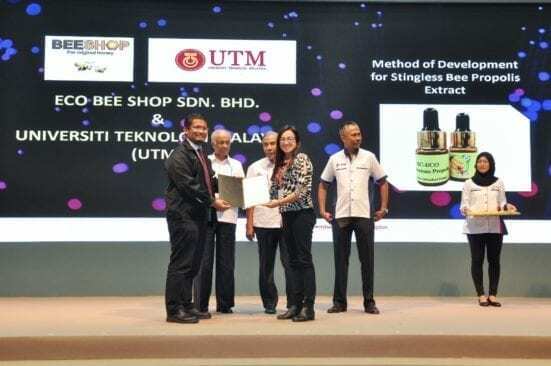 In collaboration with Eco Bee Shop Sdn Bhd (Eco Bee), UTM contributed to the program through the research project titled “Propolis Extract Production from Stingless Bees using Supercritical Fluid Extraction (SFE)”, worth RM45,000 in the form of research grant. With the aim to increase up to more than 46 percent of employment opportunities in the local economy in the near future, Deputy Minister in the Ministry of Entrepreneur Development (MED), Datuk Dr Mohd Hatta Md Ramli, at the MOA exchange event, expressed his hope that SME should continue to contribute to at least 41 percent to the Output of The Gross National Income (GDP) by 2020 as set out in the National Entrepreneurship Framework (NEF). The research grant won by Eco Bee Shop Sdn Bhd through the IIC was amongst 15 winners who have won the competition with a total of RM8million research grant awarded, to mostly selected from Halal Products & Services (which comprised of Health & Beauty, Flavor & Ingredients, Food Source Processing, Pharmaceuticals, Travel & Tour and Other Consumables), Equipment & Infrastructure (which included Machinery, Facility & Apparel) and Technology & ICT (basically for Software System & Apps and Personal Devices) project proposals.